There will be 20 trillion searches performed on Google this year, of which, 1% are performed on medical symptoms. That’s 20 BILLION searches this year dedicated to medical symptoms alone! So Google dug deep to analyze those symptoms and then re-organized its search engine results page layout to display the most common causes of those symptoms. 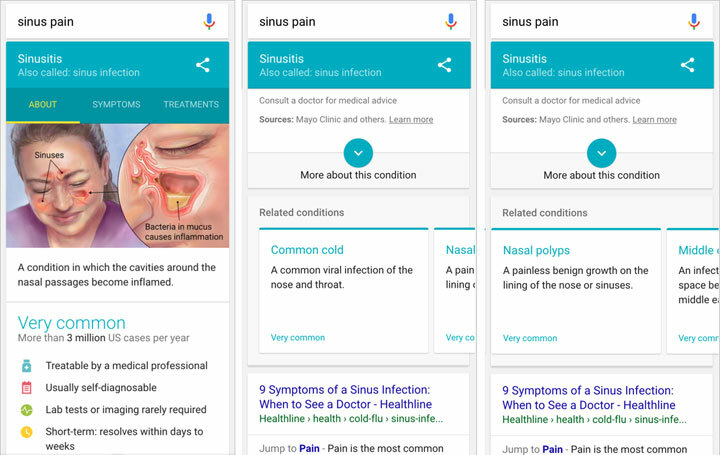 Google worked with a team of medical doctors at Harvard Medical School and Mayo Clinic to review and evaluate medical symptom information on the internet in order to produce a sample of searches to help improve its results. The reformatted and, hopefully, more concise and accurate search results page listings do not intend to diagnose. They are there to simplify medical terms, consolidate the best information the web has to offer, to make navigation easier, and to prevent unnecessary worry by the user when confronted with websites listing disparate diagnoses. It is always suggested, as Google states, that you should always consult with an ENT specialist for diagnosis and, if necessary, treatment. Each potential causes of sinus pain offers a description, treatment options, and when you might want to consider scheduling an appointment with an ENT Specialist.